The virtual aortic valve modules are created to help the novice echocardiographers to get used to the aortic root anatomy and the surrounding related heart anatomy. There are two parts: The anatomy review and the functional anatomy. We hope that this module will be helpful in gaining more insight into the 3-dimentional shape of the aortic valve. aortic valve, aortic root and related structures. 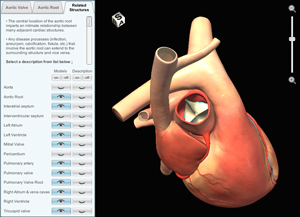 Each section builds on interactive 3D models to explain the normal aortic valve anatomy and its surrounding structures of the heart. The Functional Review module focuses on showing the relationship between a normal aortic root movement during a cardiac cycle and the anatomy of the aortic root.